Many of our clients are landlords who own only one property, such as a single or multi-family house or an apartment. Although they may be renting to a tenant, it is not their primary business or livelihood. As such, our firm is often asked to assist in removing a tenant due to a default under the lease, or due to the expiration of the lease in question. As discussed in a prior blog post, a Court proceeding is necessary in order to gain legal authority to evict a tenant. The legal document allowing an eviction to occur is known as a warrant or warrant of eviction. It is similar to a judgment, except that instead of stating that a certain sum of money is owed, it states that the landlord has the legal right to evict a tenant. A warrant can be obtained in several ways during a Court proceeding. If the parties agree to settle a landlord-tenant action, the tenant may agree to vacate by a certain date. A condition of such agreement (known as a Stipulation or Stipulation of Settlement) would be that if the tenant does not vacate voluntarily, the landlord is entitled to a warrant of eviction. Often, the agreement will allow the warrant to be issued immediately, but the parties will agree to stay, or delay, enforcement of the warrant until after the date on which the tenant agreed to vacate the premises. The Stipulation allows the landlord to have a warrant of eviction, but gives the tenant a reasonable amount of time (usually a month or two) in which to vacate. A crucial part of such an agreement is also that the tenant must pay use and occupancy during the period of time between settlement and moving out. Use and occupancy is a legal term which applies to rent paid after the tenant has agreed to surrender possession. The agreement will usually state that if the tenant fails to pay such use and occupancy, the warrant may be executed immediately upon notice of default sent to the tenant, rather than on the later date previously agreed to by the parties. Another way in which a warrant can issue is after trial in the landlord-tenant part. If the landlord prevails, the Court will issue a judgment allowing a warrant to be issued, although the Court may allow a delay in enforcement of the warrant to allow the tenant time to vacate the premises voluntarily. In New York City, City Marshals apply to the Court to obtain the warrant, and also enforce the warrants. In the suburbs, the landlord’s attorney may submit the warrant to the Court for signature by a Judge. Enforcement of the warrant (the actual eviction) is always performed by the City Marshal (in New York City), or a County Sheriff (in the surrounding suburbs which are not part of New York City). In order to evict a tenant, the Marshal or Sheriff first must serve the actual warrant on the tenant. This is done in the same manner as a process server would serve a standard lawsuit. The warrant will state the date on which the eviction is scheduled to occur, which should be at lease 72 hours after service of the warrant. 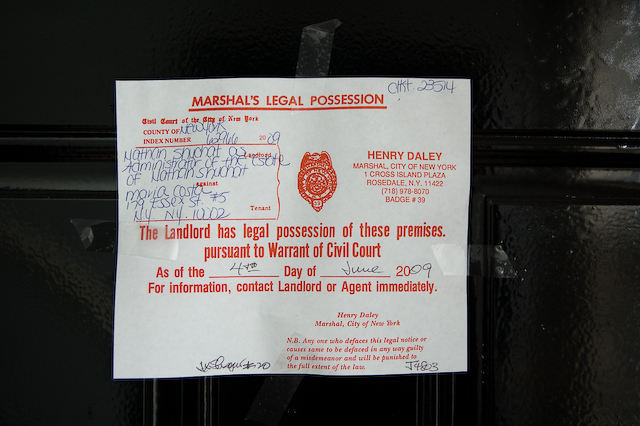 This notice is therefore known as a “72-hour notice.” If the tenant does not voluntarily vacate the premises within the next 72 hours, then the Marshal or Sheriff (usually accompanied by the landlord as well as a licensed locksmith), will go to the premises and physically evict the tenants by removing them from the premises and changing the locks. Additionally, any of the tenant’s possessions left behind will be put in storage (usually at a commercial storage facility), with the tenant having the right to reclaim their property by paying the outstanding costs and fees. Our firm represents many small property owners who are landlords, and invites all inquiries in this area.